I love a good crusty bread on it's own, but I especially love with it with all sorts of goodies piled on top. This type of thing is my go to for breakfast, a quick lunch, or for party appetizers. 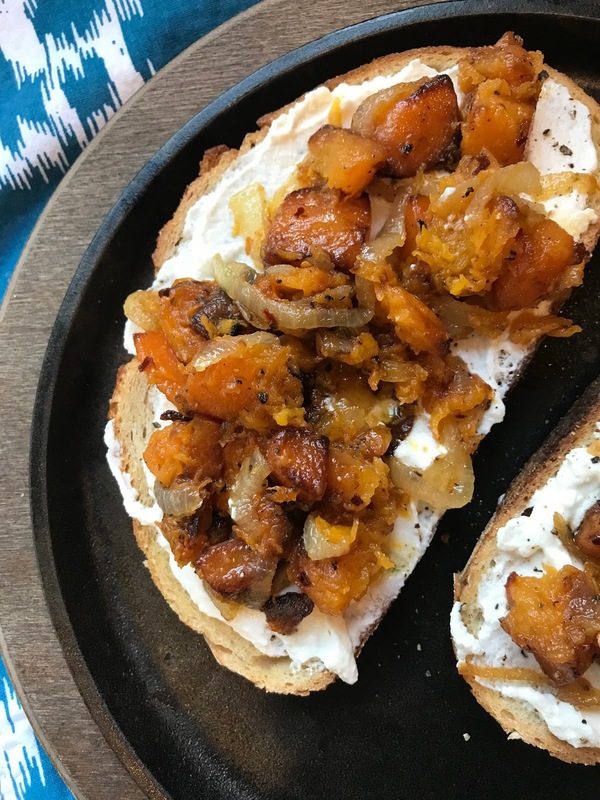 When I came across this Butternut Squash & Ricotta Bruschetta in Ina Garten's Cooking For Jeffrey cookbook, I was hooked. I've never tried a combination quite like this. 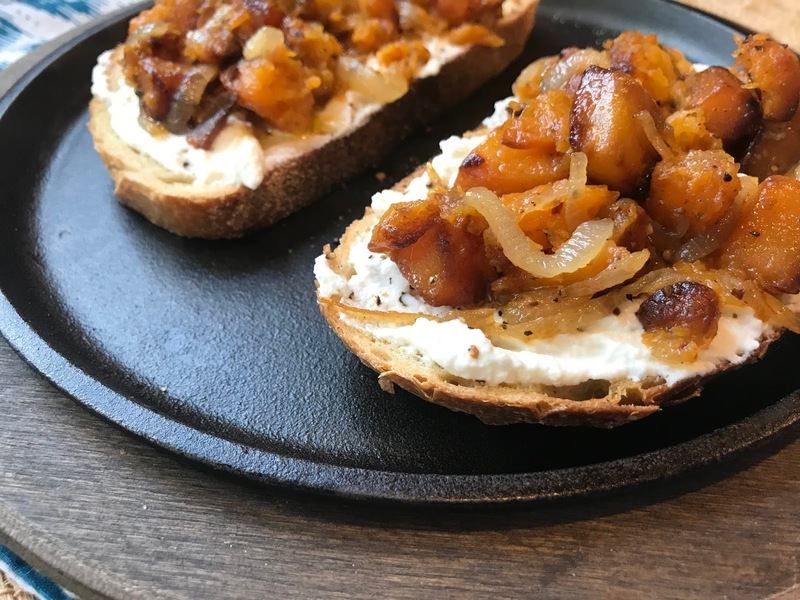 The combination of butternut squash and ricotta on bruschetta may sound strange at first, but I can assure you that this combination is so very good. In fact, I was simply blown away. The squash goes sweet from the addition of maple syrup and a hefty dose of red pepper flakes really spices things up! 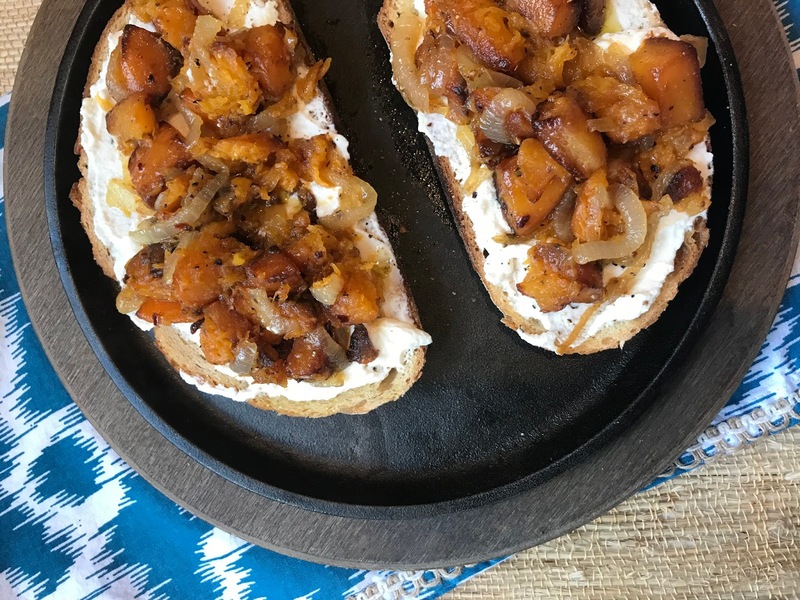 These sweet and spicy flavors marry perfectly with the caramelized onions and ricotta, and when piled high on some crusty bread, this recipe is THE PERFECT combination of sweet, spicy, creamy and crunchy. Every bite is just the perfect bite. There are a couple things worth mentioning. First, and foremost, a good bread is necessary here. 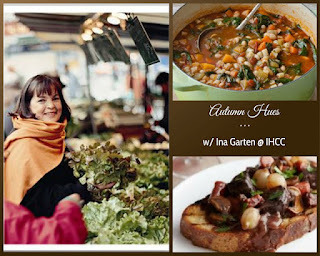 Ina uses a French baguette, which would make perfect party-sized bites. I wanted to make mine more of a meal, so I opted to use really good thick slices of sourdough. Chose your bread accordingly. The most important aspect of the bread is that it be totally crusty. Don't make the mistake of simply heating it up a tad, or perhaps just going for a little bit of crunch. You want thicker slices of bread that are toasty all the way through. This crustiness provides the perfect texture and will hold up to the hefty toppings you are going to put on top. I rubbed my bread with olive oil, salt, and pepper and put it in a 400F oven for about 10-12 minutes. Times will vary depending on the size and thickness of your bread. Secondly, do not skip the addition of the maple syrup or the apple cider vinegar. I wasn't sure I wanted any sweetness from the maple sugar into this otherwise savory dish. I'm also not a fan of apple cider vinegar and was worried that it's flavor would ruin the dish for me. On a whim, I decided to add them both and I'm so very glad I did! Those two ingredients really heightened the flavor of this dish. The sweetness of the maple sugar struck the perfect balance with the spiciness of the red pepper flakes and the apple cider vinegar....well, it simply tied all the flavors together. In fact, the topping mixture would be a perfect side dish all on it's own! I really cannot say it enough. This dish was phenomenal! I would encourage any butternut lovers to give it a try. It is a perfect autumn dish and would be really good served in party-sized portions as a Thanksgiving appetizer! 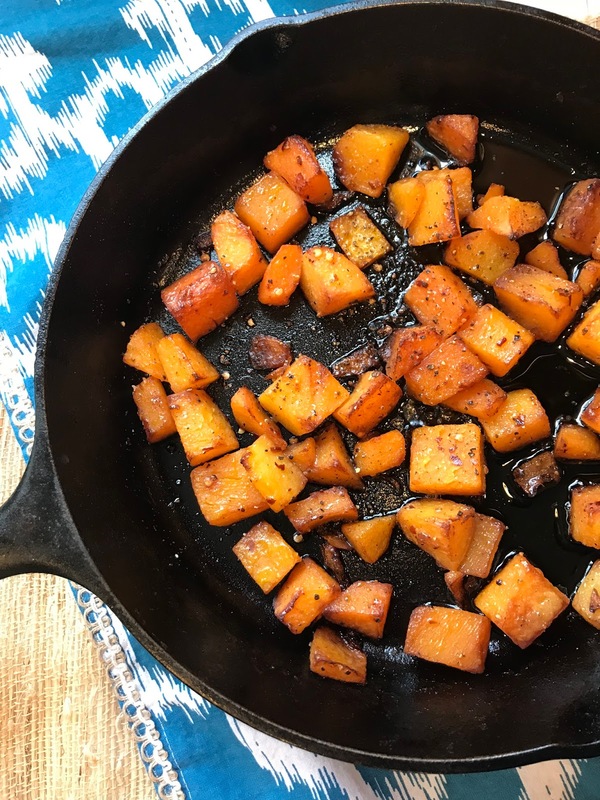 Place the squash, 2-1/2 tablespoons olive oil, 1 teaspoon salt, 1/2 teaspoon black pepper, and the red pepper flakes on a sheet pan, toss, and spread out in one layer. Roast for 25 to 35 minutes, until very tender and starting to brown on the edges, tossing once with a metal spatula during roasting. Set aside. Meanwhile, heat the butter and 2 tablespoons olive oil in a medium (10-inch) saute pan. Add the onions and cook over a medium to medium-low heat for 12-15 minutes, tossing occasionally, until golden brown. Add the vinegar and maple syrup and simmer over medium heat for 4 to 6 minutes, until the liquid is reduced. When the squash is tender, add it to the saute pan with the onions and mash it lightly with a dinner fork. If the mixture is a little dry, add a few tablespoons of apple cider to moisten. Taste for seasonings and reheat over low heat, if necessary. To assemble the bruschetta, spread a thick layer of ricotta on each toast and spoon the squash mixture on top. Sprinkle with salt and serve warm. This meal sounds so very exactly right up my alley! The most interesting reads are your tips. Tips on toasting the bread. Tips on the developing the flavor. You walk away feeling you gain something. Thanks, Kim. This looks right up my alley with squash and cheese. Now I just need to find a family that likes squash. This sounds like something my husband and I would love to eat. We've been eating low carb, so I'd put a dollop of ricotta on the plate and spread the squash over top. Yum! This looks so good! I think I could eat the butternut squash on its own! Sounds so delicious, and made into a bruschetta, looks even better! I would love this for my meal!